When I first started looking into using wood in my homebrew, my first question was “what sort of toast should I be using?” At the time I wasn’t aware there were multiple types of Oak, my homebrew shop only carries American White Oak, and the only difference I could see was the color of the wood. I had it (vaguely) explained to me that different flavors would come from the different “colors” (toasts), but that it didn’t matter too much which one I used. I’ve come to really appreciate wood aged beers and the spectrum of character that wood can provide. It has become a big part of my research, and in that research I’ve repeatedly come to the conclusion that the toast of wood absolutely matters. I’ve tested it. But if it matters, how? Why? And what toast should I choose? Time to explore the wonderful world of toasting wood! Barrels are constructed in a cooperage by taking staves (the individual length of oak), setting them in a ring, and bending them into shape, then setting that shape with more rings. 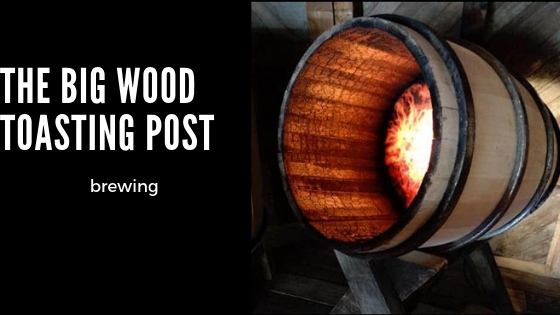 By heating the staves, they become more pliable and it is easier to bend them into the shape of the barrel. Some cooperage’s use steam to heat the barrels, but traditionally a flame is used and a very light toast can be imparted. The actual toasting process is a different step. Once the barrel is shaped and set in place, the toast is applied per the needs of the specific barrel. The shaped barrel is set over a flame, and the intensity and duration of this flame is determined by the needed level of toast. In homebrewing, we have some other additions available to us that follow a similar but not quite identical path. Cubes are often toasted as staves, and then cubed. This results in a cube that has a noticeable red layer (the toast depth) on one side, while the other sides are lighter. Occasionally, staves are first cubed then toasted over a fire so that the toast is even on the outside of the cube. Chips are almost universally chipped first and then toasted so that the toast is even on the surface area. The reason for this wasn’t made explicit, but if I had to make a guess it would be that because chips impart their flavors so rapidly, and that flavor is so one dimensional, it makes more sense to keep the toast consistent. Spirals are fashioned from oak, though not necessarily from staves. They are designed to be an easier way to oak age, a single unit with an increased surface area (the spirals). Like chips, they are toasted as a whole unit. There are other sorts of additions as well, but the idea is the same. The wood is either toasted before being shaped (cubes) or after (barrels, chips, spirals). Cellulose is a natural polymer, the most abundant one on Earth, and is composed of linear chains of glucose. Its primary use is holding the wood together, and it doesn’t have a particularly large role in producing flavors. Hemicellulose, along with cellulose, is found in the cell wall of plants and consists of short chains of sugars. Those sugars, when heated, are capable of caramelizing and producing a wide variety of flavors, including almond, walnut, caramel, maple, licorice, and the “toasty” flavors/aromas. Lignins, also part of the cell wall, are vital in conducting water, and are composed of monolignols. When heated they break down and are responsible for producing the vanilla flavors and the smoky, clove, and floral aromas. At varying toast levels and temperatures, these compounds release different characteristics, each appropriate in different circumstances. Another bonus of toasting is that it mitigates the tannic quality of raw wood. Tannins can lead to some beneficial mouthfeel, but they can also impart an astringent quality to your beer. In raw wood, the surplus of tannins can lead to off-flavor-like qualities very quickly, much faster than the other compounds that you may want from the wood. Toasting breaks down tannins, lowering the amount that will end up in your beer or wine to more desirable levels. There are other reactions that occur with toasting as well. Obviously, the color of the wood changes, as does the texture of the wood (though no nearly on the scale of charring). What are the different toasts of wood? Typically, the toasts of wood are divided into three categories: Light, Medium, and Heavy. These toasts are created by toasting the wood for more or less time with more or less heat, and the shift in the levels of broken down compounds results in different characteristics from the barrel to its contents. Typically toasted at a low temperature for a longer period of time. This breaks down tannins and hemicellulose, and facilitates the formation of vanillin, the chemical compound from lignin that is responsible for the vanilla flavors and aroma. Since the wood is closer to raw than the other toasts, more mild, fresh wood characteristics are contributed to the aroma and flavor with this toast. The lower temperatures also result in more tannins being present, and more tannic qualities (including increased mouthfeel, when controlled) are found. Light vanilla flavors are present, but due to the lack of heat lignin isn’t broken down too much, which means the vanilla is a bit restrained, but also means that smokey flavors aren’t created. When should I use a light toast: Use a light toast when you are looking for woody, earthy, restrained vanilla characteristics. Personally, I use light oak when I am making beers like a lighter Old Ale, where I want the restrained character from the wood to be detectable but not dominating, and for the tannins to contribute to mouthfeel. Also appropriate in styles like Flanders Red if you want a lighter vanilla character. Toasted at a moderate temperature for a long period of time, which avoids harshly charring the wood and focuses primarily on the breakdown of hemicellulose, resulting in the carmelization of sugars. Because of the medium heat, lignins are broken down a bit more and vanilla characteristics are much more prevalent at this toast than at lighter toasts. The additional heat also results in less tannins. Due to the breakdown of hemicellulose and the carmelization of some of those sugars, medium toasts can contribute toasty, caramel, and maple flavors, as well as a well-rounded wood characteristics that is less “raw” than the wood characteristic of lighter toasts. When should I use a medium toast: If you’re looking for the contribution of the wood to be a bit more obvious, you’ll want at least a medium toast. At this point, the balanced and multi-layered contribution of the wood becomes an aspect of the beer that is harder to ignore than the more one-dimensional contributions of a lighter toast. I use a medium toast for all of my wood-aged beers, except for the darkest like Russian Imperial Stouts. Oud Bruin, Old Ale, Flanders Red, Wee Heavy, any beer that you want to wood age and add some balanced complexity to is calling, in my opinion, for some medium toast wood. Often the result of a two-step process. First, the wood is heated briefly at a high temperature, resulting in a strong surface toast that will impart smoky flavors. After that, there is often a medium toast for a slightly longer period of time which creates a red layer, penetrating the wood more fully and allowing for more complex flavors to develop. Some vanilla flavors may be present but at this point the compounds in the wood have largely been broken down and the flavor and aroma are typically dominated by smoky, roasty, coffee like flavors balanced with notes similar to those present in a medium toast. When should I use a heavy toast: I only use a heavy toast when I’m going bold. Big Oud Bruins, Russian Imperial Stouts, something that will benefit from those heavy characters from the wood. If you’re looking for heavy roasted characters with a coffee, almond, smoke like background, heavy toast is the way to go. Different woods contain varying levels of the compounds we have talked about, and so there isn’t a hard-fast rule for “how much heat and time produces what compounds”. Even if the type of wood didn’t matter, other factors such as humidity, climate, and age of the wood also affect how the barrel is toasted. Below is a chart of roughly at what temperatures different characteristics are formed in American Oak, but keep in mind that this chart, while a good starting point and rule of thumb, isn’t universal. You’ll notice that, as the temperature increases, lignin, tannins, and other compounds are broken down, resulting in an increase of vanilla and sweet qualities while rapidly diminishing the raw oak character. Towards the middle of the chart, right in line with a medium toast, vanilla flavors are at their peak and toasty flavors begin to develop as well. Finally, we end with those acrid, roasty, and almond-like qualities. I did, I did say that. I also said I tested it. The toast of wood making a difference is one of those things that seems obvious. Of course a light toast will be different than a heavy toast, vinters and distillers have known this for years. Thanks to folks like Drew Beechum and Denny Conn (authors of Experimental Homebrewing) and the people behind blogs like Brulosophy, it has become something of a trend in homebrewing to test the status quo and challenge conventional wisdom. I’m all for this, not because I think everything we know about homebrewing is wrong, but because nothing should be beyond question. Since the guy at the LHBS is convinced that the toast doesn’t make much of a difference, I decided I needed to test it. And involve him. And rub his nose in it. For this experiment I decided on using my American Stout, primarily because I know it tastes good wood-aged and I really feel like having some stouts around. I treated my RO water to the Dark Malty profile in Bru’n Water, and hit a beautiful mash temp of 152F. In hindsight, this is a little low and next time around I’ll probably aim for 154F. I love the smell of a two hour boil. All of my stouts get boiled for a long time, I have absolutely nothing to back that up with. And here they are fermenting away! I racked into a bottling bucket before splitting them into the fermenters to make sure the gravity was even (measured and just missed OG at 1.059). After two weeks in the fermenter (lost track of time!) with Scottish Ale Yeast, I went ahead and added these great looking medium toast oak cubes to the batch (notice that they have a consistent toast, meaning they were cubed first then toasted) on the left, and some heavy toast oak cubes from the same company on the right. Both were boiled for 15 minutes prior to being added. I let them sit for two months. This was about 1.5 ounces of oak cubes, so two months is the lower end of what I usually recommend, but I wanted a more subtle wood presence. Plus, if the beers are distinguishable, that’s even more of an argument for toast being important. After bottling and letting the beer sit for another three weeks, I went to the homebrew shop in my parent’s town. The guy who had talked to me about oak cubes two years ago was, not surprisingly, not working. Regardless, I got 8 people to participate in a short triangle test, which (if I understand correctly) means I would need 6 people to correctly guess the odd beer out. Participants were given three glasses side-by-side, two with medium toast stout and one with heavy toast. I asked them to pick the odd beer out based on aroma and based on taste. Based on aroma, only 4 people correctly guessed the different beer. Based on taste, 7 people were able to distinguish the heavy toast beer as being different than the medium toast. Literally every single participant said that there was something different in the aroma, but only four picked correctly. So in a big roasty stout, maybe the toast will contribute to aroma, but not enough to make a difference on toast alone. Personally, in my blind tasting, I couldn’t smell the difference between the two. For taste though, the people who choose correctly noted that the heavy toast beer was a bit roastier and more acrid. Five of the participants said they perceived the medium toast beer as sweeter. I personally don’t think the medium toast beer tasted sweeter, and while there was statistical significance the beers were more similar than I’m comfortable with. I was expecting more of a stark difference, but it wasn’t there. That said, this isn’t hard science, and this wasn’t even tested rigorously. You could easily disqualify everything I’ve said, in fact, I encourage you to. Give this a shot for yourself! Worst case scenario, you have some awesome wood aged beer around and a reason to buy a certain toast in bulk. Best case scenario, you fine tune a beer to a specific toast! Its a win all around! I’ve written about this before for Homebrew Finds while Chris was doing some travelling, and it was also a popular section in the initial Wood Primer. Most local homebrew shops will have some kind of wood available, but it is almost always a type of oak. In the spirit of DIY, terroir, and finding the perfect ingredient for my specific brew, I went about testing different kinds of woods, and this meant toasting the wood myself. The most readily available and diverse selection of food safe wood tends to be the wood chips used in toasting. Despite some of my reservations about wood chips, they can be used effectively and they are a good starting point for exploring a specific type of wood in your brew. If you can get a hold of cubes or spirals and want to toast them, this guide will still be a good rule of thumb but you’ll need to play with the timing a bit! As I explore more toasting options and times, I’ll update them here! Determine the type of wood (I would stick to toasting chips for now, check out the wood primer for determining the appropriate wood to use) and temperature you want (use the chart above as a reference). Take the wood out of the oven after an hour, toast longer if desired. Note that if you want a light toast, it won’t take an hour. Use your judgement! Last year, the blog Homebrew Dad (now BrewUnited!) ran a short contest to give away some yeast cultivated from the famous Heady Topper. The contest was to submit a recipe that you would use the yeast in, and I wanted to make a cherry wood IPA. Cherry wood tends to have light vanilla, earthy, a little astringent, and something a bit like dried cherries. I thought this would go really well with the supposed stone fruit characteristics of Conan, and so I was really excited about giving it a shot. I didn’t win the contest, but I was still excited about the recipe, and so in preparation for my post on Homebrew Finds I brewed it. I bought Cherry smoking-wood chips from my local Walmart after calling the company and ensuring no chemicals were added to the wood. For this recipe, I wanted hints of vanilla while complimenting the naturally sweeter, earthy characteristics of the wood, and so using the chart above as a guideline I decided to toast at about 350° Fahrenheit. Since I’m using chips, the toasting process will be fairly quick and I set a timer for one hour, checking the chips every fifteen minutes. Now, I was going for a lighter toast. I wanted a bit more restrained vanilla, while still having a bit of that raw wood character, so an hour was absolutely too long. I boiled the chips and added them to secondary, and ended up enjoying the beer. It was a little astringent, but there was more of a vanilla/toasty character than I had wanted for the recipe. It ended up dominating the beer, but did give it a really nice color. Still think I would have preferred a lighter toast. The toast is a big factor in determining what characters your beer will get from wood. It is also one of the things that makes wood so great, the spectrum of flavors and aromas it can provide is nothing short of impressive. Whether you believe the level of toast makes a difference in your beer or not, I’d encourage you to look into different toasts for your brews and trying them out for yourself! I hope this helped explain toasting a bit, and I know researching it has been incredibly valuable for me. If you see an error, or just want to share your experience, feel free to let me know!